With a touchdown celebration by the Dallas Cowboys' Ezekiel Elliott helping to fill its kettles, the nonprofit is taking advantage of its jump in visibility with an impromptu social media campaign. Ezekiel Elliott jumps into the Salvation Army's Red Kettle, bringing with him a 61% increase in online donations. (Image via the Salvation Army’s Twitter account). As of Sunday, 21 is the Salvation Army’s lucky number. 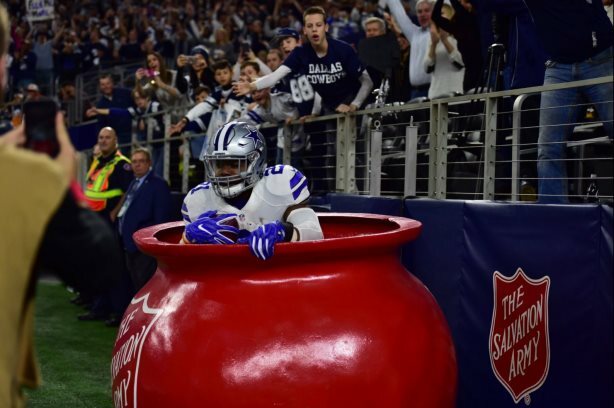 After Dallas Cowboys running back Ezekiel Elliott hopped into a large-than-life Red Kettle after scoring a touchdown against the Tampa Bay Buccaneers on Sunday night with more than 25 million people watching, the number became a rallying cry for the nonprofit: $21 can feed a family for three days. Shortly after the rookie star’s leap, the organization saw a 61% spike in online donations. Its staff updated its website to reflect the news, and the donations page was changed to say "Time to Feed Others," a nod to Elliott’s "feed me" celebration. "I’ve been in this position for five years and nothing else has come close to this during the Christmas season," said Lt. Col. Ron Busroe, who serves as the organization’s national spokesperson. "By the time we got the office, we already had phone calls from the four major networks." The amount of coverage the Elliott story received has at least equaled that generated by the Salvation Army South Africa through its viral campaign against domestic abuse from this spring, Busroe said. Dallas-based Richards Partners has served as the Salvation Army’s national PR partner for about four years and advertising partner for about a decade. For this story, Richards fielded interview requests, such as Busroe’s appearance on Fox News, and advised on the type of message the organization should emphasize. The halftime show of the Dallas Cowboys’ annual Thanksgiving Day game has been the annual launch of the Red Kettle campaign for two decades, according to Patrick Patey, the Salvation Army’s marketing and comms director for the Dallas-Fort Worth area. "There’s been a huge interest in local media," Patey said. "And almost every major media outlet contacted us. We appreciate the increase in attention and awareness around the Red Kettle campaign, especially in this critical week leading up to Christmas, which is our biggest time for donations." The organization’s donation goal is $2.5 million. Donations are being logged by the Salvation Army’s computer system, called the Red Kettle Worker, so it’s unclear whether the group has exceeded that amount. Asked if the group will continue to use the story to generate donations, Busroe said, "At this point, we’ll see. We would certainly like to keep the story alive. But these kinds of things have a momentum of their own. There’s not much we can do to keep it alive."